A:We are a factory and we have professional team of workers, designers and inspectors, most of them have a lot of experience in this line. 2.Q:What is your main products? 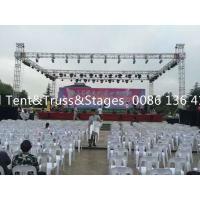 A:Our main products are stands on stage, like Microphone Stands, Speaker Stands, Keyboard Stands, Lighting Stands, Mobile Truss Stands, we also accept OEM and ODM. 2.Good quality products for world famous brand. 3.One stop purchasing on stands. 4.Fast response and professional suggestion on all inquiries. 5.Professional engineers can design the products as your request. 4.Q:What is your Minimum quantity? A.The MOQ is based on products and amount. 5.Q:What is the delivery time? A:For normal products, the delivery time is 5-10 days after receive the deposit. We are a big factory and we will prepare our common products as stock. 6.:What is your contact information? Welcome to our factory and visit, we could help with the visa application and making schedule.